In Part I we discussed a few different dart games you can play. Today we’ll cover dart throwing technique so more of your darts will find their target, allowing you to buy less rounds of beer for your buddies. There are four basic elements to a successful dart stance. They include lining up properly, consistency with the angle of your stance, shoulder position, and having a firm footing. 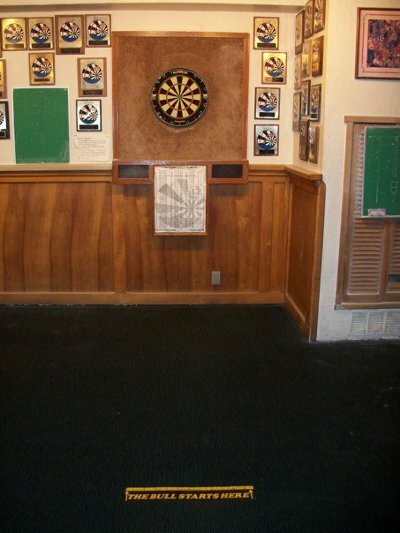 When lining up for a throw, ignore the center marker on the dart throwing line on the floor. The lines may be inaccurate. Draw an imaginary line from the center of the dartboard to the floor and then to your foot. Find a part of the dart throwing line (or a mark or scuff on the carpet) to mark that imaginary line, and make sure that you line up in that exact spot every time you throw. Consistency with your technique is key for a successful throw. The angle with which you align yourself to the board can be either sideways or forward facing. According to NiceDarts.com, a sideways stance encourages a more accurate throw because it aligns your eyes and your throwing arm on the same line and reduces the possibility of your elbow drifting away from your body. This seems to work best for me, but others prefer to face the board with their front foot pointing at the bull’s eye. Your footing should be arranged for balance and comfort. Place your feet shoulder width apart with your front foot flat and carrying the majority of your weight. Your back foot may lift slightly. Your back foot maintains your balance. Shoulder position will vary from player to player based on what they find most comfortable. 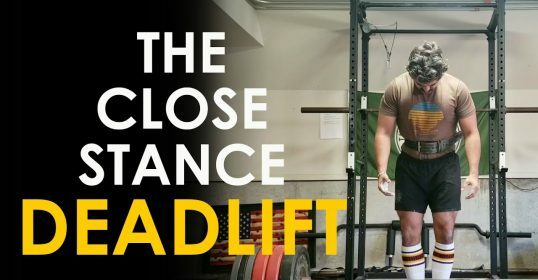 Ideally, your shoulders remain as close to parallel with the floor as possible. Keep your shoulders, spine, and legs fixed when throwing, but let your throwing arm be loose and relaxed yet in control. As with the stance, there are four things to keep in mind when aiming your darts, according to the darts experts at NiceDarts.com and DartBase.com. They are: leading with your elbow, finding a sight line on your throwing hand, aiming directly at your target, and knowing and using your dominant eye while aiming. Position your elbow so that it points directly at the dartboard, and if possible, slightly upwards. My arm mechanics can’t quite accomplish this, so I simply point my elbow at the dartboard and don’t worry as much about it pointing upwards. For me it’s just too uncomfortable. Find a sight line from your throwing hand to a precise target on the board. 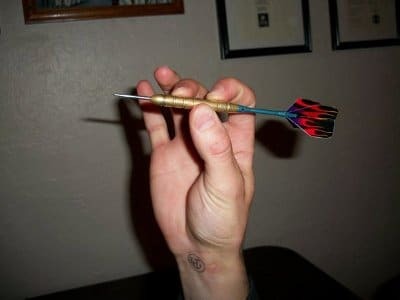 Some use the point of the dart for this; others use a knuckle on their thumb. The main point here is that once you find what works for you, keep it consistent. One problem that many dart novices struggle with is not aiming directly at the target they want. If you are looking to hit a triple nineteen, aim for the center of the triple nineteen, not the general area. Also, avoid overcompensating for a poor throw. For example, say you aim for the triple twenty but hit the five to its left instead; refrain from aiming to the right of the twenty to overcompensate for your previous throw. Aim for the triple twenty again. This all builds consistency. Lastly, aim with your dominant eye. To find out which eye of yours is dominant, practice a few throws with one eye closed. Whichever eye struggles to stay closed is your dominant eye. Your grip is dependent on two elements: the type of dart barrel you use and the finger placement that is most comfortable for you. What you should make sure of is making the point of the dart face slightly upward and that your grip is relaxed but also firm. Your fingers should only hold the barrel of the dart, not the shaft or flight, and any fingers that are not touching the barrel should remain in an open, relaxed position, not curled up into your palm. Play with it and see what feels most comfortable for you and then stick with it. To achieve this parabolic curve, the first thing to be aware of is the movement of your body and shoulder. Do not move your body or shoulder! The only thing that should move in your throw is your arm, while your shoulder and body remain fixed. Some suggest that your elbow remain fixed during the throw as well, however, in order to aid in a parabolic curve, the elbow will remain fixed only when you bring your hand backwards, but it should rise up slightly during the acceleration of the dart. Just before releasing the dart, many professional players let their wrist snap slightly to increase acceleration. Allowing the wrist to snap, and therefore increasing your dart’s acceleration, it makes it so that the rest of your arm can be more relaxed during the throw, thus resulting in a more accurate and consistent throw. Lastly, make sure you have some follow through. After you release the dart, your arm should continue in the throwing motion so that it stops once it is pointing at the target you are aiming at. Let it hover there for a moment rather than falling to your side immediately after releasing the dart. You’re now ready to start throwing your mini-arrows with a little more confidence and know-how. I find that a game of darts washed down with a delicious, frothy beer at my favorite pub is the perfect remedy to a long week, and quite simply, just a great pastime. If you haven’t played darts in a good long while, give it a try this week. Some of the techniques described here are debatable. 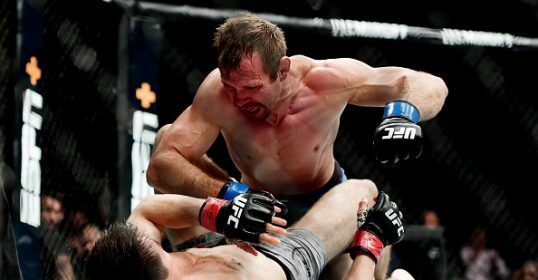 As with any sport, people develop their own ways of adjusting technique to what feels comfortable for them. Do you have any additional tips for the beginning dart player? Share your tips and advice with us in the comments.